Sodium Acetate Market size was estimated over USD 120 million in 2016 and the industry will grow by a CAGR more than 7% up to 2024. Sodium acetate is colorless deliquescent and commonly known as the sodium salt of acetic acid or sodium ethanoate. Significant demand from the processed food industry owing to rise in income level of consumers, round the clock working hours and shift in consumer eating habits will boost the sodium acetate market over the forecast period. The product is extensively used as an emulsifier, preservative and flavoring agent in dairy products, cheese, chips, poultry, meat and other edibles. The product can be mixed with vinegar in order to form sodium diacetate which delivers a pungent flavor to eatables. Rising supply chain issues of food items which include delay in transportation, less shelf-life, etc. has resulted in a greater importance in preserving food and subsequently using preservatives to prolong the shelf-life of food products. Hence, this will bolster the sodium acetate demand in food preservative industry by 2024. High import duties along with availability of the several substitute products are the crucial factors for restricting the sodium acetate market growth throughout the forecast spell. Similar food additives and preservatives are available in the market and are acting as substitutes for sodium acetate. These food additives and preservatives are likely to pose a threat to sodium acetate in the near future. Additionally, higher concentration of acetic acid is used to maintain the acidity, which is approximately hundred times higher than normal plasma levels of blood. This may result in increased plasma acetate content and promote hemodynamic instability and acidosis. Thus, higher dosage of sodium acetate may adversely affect the patient’s health. This in turn, will be hampering the sodium acetate market growth by 2024. Sodium acetate market is segmented into trihydrate and anhydrous products. Among these, sodium acetate trihydrate was valued at over USD 65 million to seize around 60% of the entire industry share in 2016. The product is used extensively in leather & textile industry as a pickling and buffering agent. Moreover, it is employed in dyes which are further used for textile printing such as dyeing silk, wool and other natural fabrics. Anhydrous sodium acetate held over 35% of the total market share in 2016 and will lose its market share in coming years due to its excessive cost. 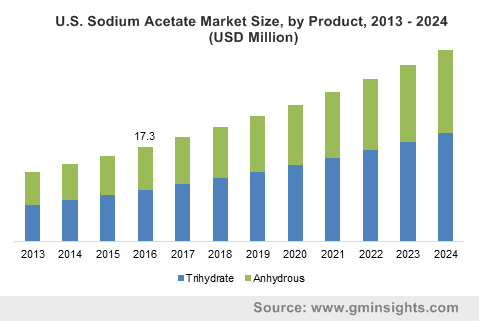 This in turn, will strengthen the trihydrate sodium acetate market penetration by 2024. Leather & textile and medical & pharmaceuticals are the dominant end-user industries in sodium acetate market together accounting for more than 60% of the entire market share and will grow at a significant rate. The product is majorly used as a washing salt in the leather industry and mordant in textile & leather industries owing to its superior physical properties such as high solubility, density, etc. It is also employed to increase the uptake of dye and protect it from light during the dying process. Moreover, it removes electrostatic force during cotton processing in textile industry. Food industry accounted for over USD 26 million for sodium acetate market in 2016. The product finds its usage as a preservative and to prolong shelf life of food items such as meat, poultry, dairy products, etc. It is mixed with vinegar to create a specific flavor in some of the delicacies and also used as seasoning agent. Positive growth in food industry especially in emerging economies will positively stimulate the sodium acetate market demand in next coming years. 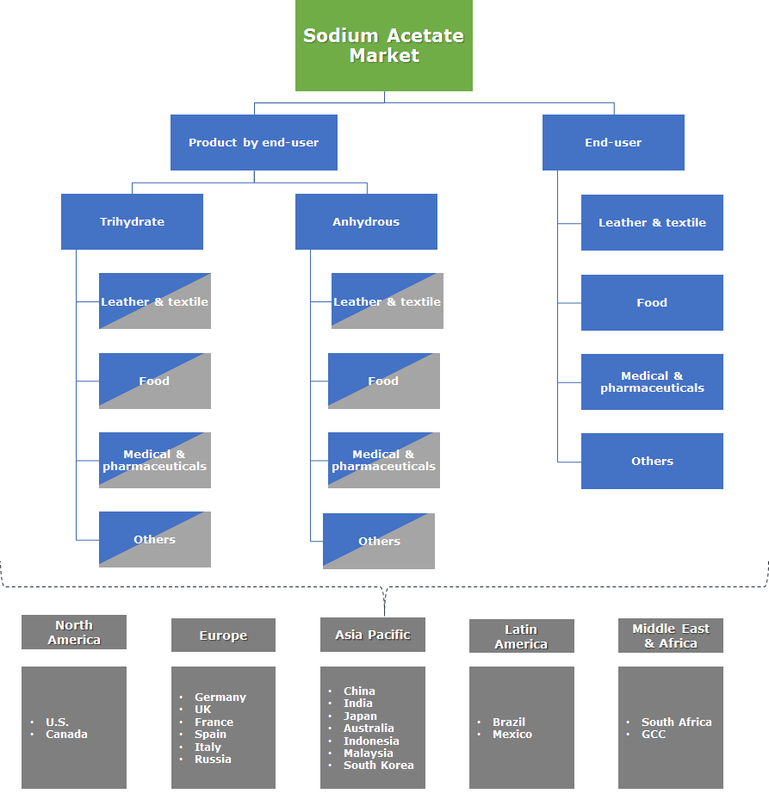 Asia Pacific was major contributor to the sodium acetate market and the region accounted for around 55% of the global sodium acetate market in 2016. Its market share is likely to expand in the near future, owing to growth in leather & textile, food and other industries in the region. Rising demand from food industry for preservation of dairy products with rapidly growing leather & textile industry will contribute towards the sodium acetate market development in future. North America had a market share of more than 18% of global sodium acetate market in 2016 and is anticipated to expand at moderate pace over the forecast period. This can be attributed to the growth in the regional medical & pharmaceutical industry. Europe held over 15% share of the overall sodium acetate market and will lose its share in coming years owing to the stringent environmental regulations and high import duties on raw materials. Changshu Nanhu Chemical, Lonza, Nantong Zhongwang Additives, CABB, Cayman Chemical, Karn Chem Corporation, Niacet Corporation, NOAH Technologies Corporation, American Elements, Spectrum Chemical Manufacturing Corporation, HiMedia Laboratories, Gelest, Inc, Sisco Research Laboratories and Daito Chemical are some industry participants in sodium acetate market. The companies participated in acquisition, merger activities to expand their production capacities and also established their presence in several regions across the globe. For instance, in April 2014, CABB Group was acquired by a London based equity firm and this will positively influence the company’s growth in the market. In March 2013, Niacet Corporation acquired Kemira's food, pharmaceutical and acetate-based chemical business, which will boost the company’s overall product portfolio and also strengthen the position in the market. Continuous growth in several industries such as textile, medical, food and others will boost the sodium acetate market growth over the forecast period. This is all due to the wide acceptance of the product as a food preservative agent, buffering & pickling agent, diuretic agent in medical & pharma, leather & textile, food and other sectors. Additionally, significant production expansion in Asia Pacific region will spur the sodium acetate market growth in coming years.